The ancient Silk Road was one of the greatest trade routes ever, stretching from Asia to the Roman Empire. 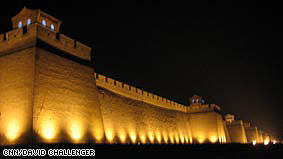 Starting from Hong Kong, CNN.com's David Challenger travels the Chinese section between Xian and Urumqi, but not before hitting the mesmeric city of Pingyao. For Buddhist art, Islamic architecture, towering sand dunes, diverse ethnicity and much more, click here and start the journey. It's about 7 hours by bus from Pingyao to Xian -- Shaanxi's largest city and the eastern gateway to China's ancient Silk Road. The Banpo Neolithic Village and famed Terracotta Warriors further complement Xian's substantial attractions. The train trip between Xian and Dunhuang winds though the Hexi Corridor in Gansu -- once the sole thoroughfare for Silk Road travelers. Home to China's ethnic Uighur population, Xinjiang is more attuned culturally to Central Asia than anything lying east. Given the chance, which of these trips would you like to make?